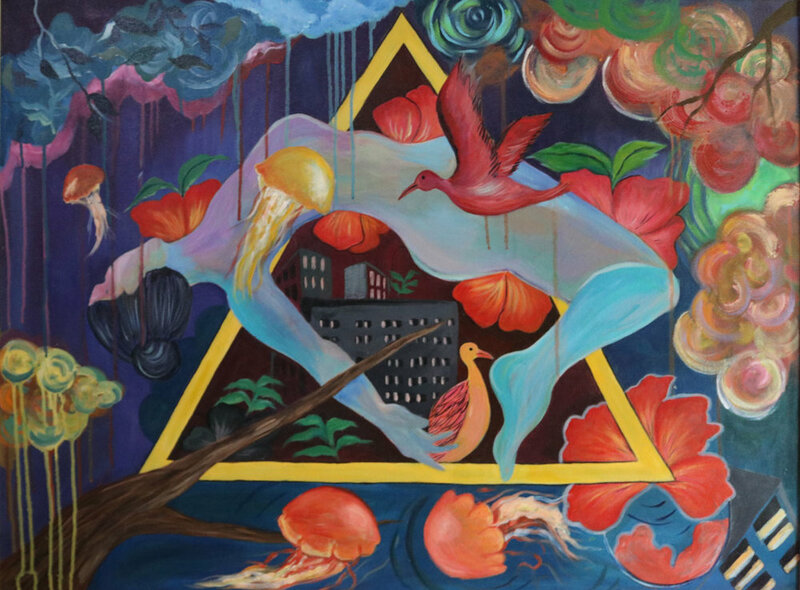 Kirti Kalra is a 21-year old painter, currently in the fourth year of her BFA at the College of Art in New Delhi. She embraced art as a profession when she was in the seventh standard and her painting practice has flourished since. She has won approximately 50 awards in painting competitions. Her works contain vibrant colors and lush compositions that often step into the surreal, portraying a world far beyond that which she experiences with her speech and hearingimpairment. In addition to painting, Kalra is a skilled athlete. She won three gold medals in badminton at the 2013 Special Olympics Asia Pacific Games in Newcastle, Australia, as well as a silver medal in pairs figure skating at the 2013 Special Olympics World Winter Games in South Korea. Kalra and her sister, Simran, were also featured in a performance of the Indian Sign Language national anthem with Amitabh Bachchan, which can be viewed on YouTube. Humans of Sign Language. "It was at the age of eight months..." Facebook, 17 July 2017.